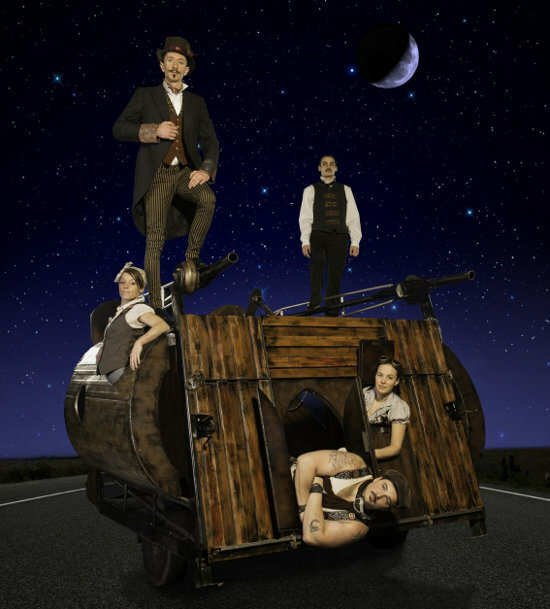 Inspired by The Other World: the Comedic History of the States and Empires of the Moon written in 1657 by the real Cyrano De Bergerac, La Balade De Bergerac is an outdoor show for street theatre festivals aimed at capturing the imagination of a diverse audience. Our central character is Monsieur Cyrano La Lune, a wildly imaginative poet and inventor whose head is filled with a maelstrom of fragmented thoughts and ideas. Today he is inspired with a rousing passion to travel to the moon using the magnificently strange and battered mechanical contraption that is his home. Monsieur La Lune’s crew are extremely skilled, courageous and willing but they are forever being distracted by their own sense of fun and anarchic playfulness on swinging cloudswing, Korean cradle and aerial tin bath, or by turning silks into airship sails to ascend to the heavens using the grueling medium of Trance Travel! La Luna gathers his crew, chosen for their special skills: the valet, Sebastiano, meticulous and fussy; the navigator, Selendina, an indecisive map reader; the mechanic, Raganaux, rough, irritable, but also a romantic; and finally Tic Toc, the new crew member, loyal, but mischievous, who rises to the occasion in the end. Their mission: to reach the moon – a world where the imagination can be free. Tour dates: Primarily beginning of June and most of July and the beginning of August 2013. Also seeking bookings for outdoor version in summer 2014 and expressions of interest for an indoor version for winter 2013/2014. Support: The company will be looking for support at the end of the year to develop the indoor version. At this stage they are still considering what support this might be, but creation space, opportunities to premiere the show, financial support or collaborators are welcome possibilities. The set is made up of two large structures: (1) Static rig 8.5m high x 4m wide, used for aerial techniques, but also to climb on, to see from, create different levels, and ultimately to get the team flying with its own pair of wings. (2) A movable structure: Monsieur La Lune’s flying machine, inspired by steampunk aesthetics. It arrives into the space and is transformed as the show develops. It is the crew's home, their ship, their main invention. On it they weave through windows, open hatches, propel each other up into the air… it transforms into a high-flying aerial apparatus! It has a trailer base and is also used for transporting equipment. It is roughly 3m wide x 4m long x 2.5m high when assembled and can disassemble to 2.2m wide x 3m long x 2.5m high. 6 ballast of 1 tonne or ability to stake into the ground. For indoor spaces either ballast or rigging points of the same tonnage. For indoor spaces the ceiling height must be at least 9m with a clearance of 6.5m both in front and behind the rig. The space must have a large door of at least 2.2m wide and 2.4m high through which the company can bring their set. For some gigs that are bigger/longer/more complicated the company will have one technician with them. For smaller and simpler gigs the technical work is done by the performers.